They're massive and quite the overkill.And I love it! I found a method on how to fix squeaky waist function. Anyone interested? It does, but it pretty much doesn't affect posing at all. Yeah you should post it. Squeaky Waist Articulation: A quick and easy fix! DISCLAIMER: Some of these mods are possible, some aren't. They're not large changes, they're just impossible to make because the pieces aren't molded in that color or slight modifications to torso printing. Using the same pieces that connect both halves of the shadow traps, the wings are extended and are now posable. Or downward for when not in flight. Better posability and a better range of motion. The arms are now more proportional. Exact build as the one from Mask Maker vs. Skull Grinder. 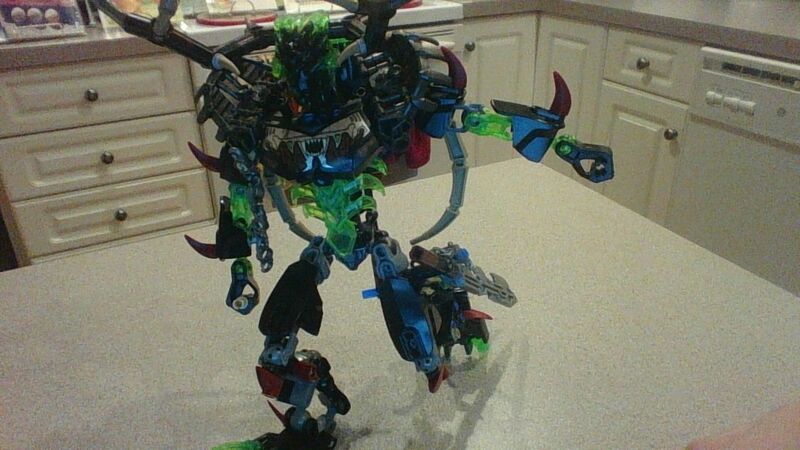 Similar to @Scorpion_Strike's design for Ketar. Reversed function. Now when you move the tail forward to "sting" enemies, the front crystal blades would move inward to slash enemies. This is my lazy MS Paint recoloring. Just ignore the rendering error on the right leg. 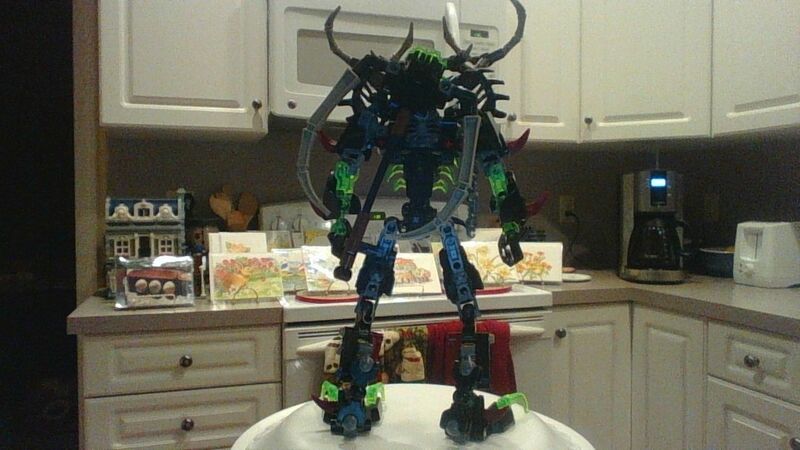 The upper leg armor would be dark orange and so would the Bohrok eyes on the arms. The torso would remain dark tan, but would have much more dark orange printed on the chest and abs. The spear would remain the same but would have a silver Bohrok tooth on the other end. The chain on the boulder would be extended slightly and the boulder mace would be a separate weapon. 1.Upper Arms and Upper Legs. Like someone else in the topic said, using the orange Skrall armor on both legs looks like a skirt. Not an overly feminine one, but more like a warrior skirt, like Gal Gadot's Wonder Woman has. The upper arms now look less gappy with the larger armor shell. Say what you will about my MS Paint skills, the Mata Red can balance out more by using it on the upper arms and hands. The crystal armor would be gold and trans-purple. For Melum, nothing really needs improvement that much IMO. Kopaka would have the thigh stickers from 2015 on his lower arms, but the stickers would be a little different in design. They would be white with some blue markings and a little of that silver/light green. The Hordika head shoulder joint would be moved up to the next axle hole. 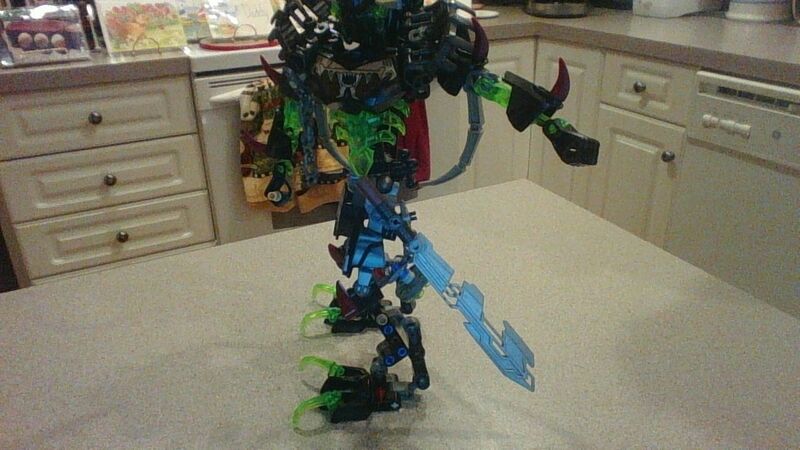 By switching out the Technic connectors on the bow's riser with the same connectors used for the Shadow Traps, the bow can fold up and be stored easier onto his back. I would switch the sword and extra ammo holders. When the sword is placed on the side attachment point on his hip, it doesn't obstruct as much movement of the leg and looks better in poses. Exact build as the one from Mask Maker vs. Skull Grinder but with a trans-lime base. I know I'm late to the party, but I've got two modded Uniters to share! Up first: Lewa! 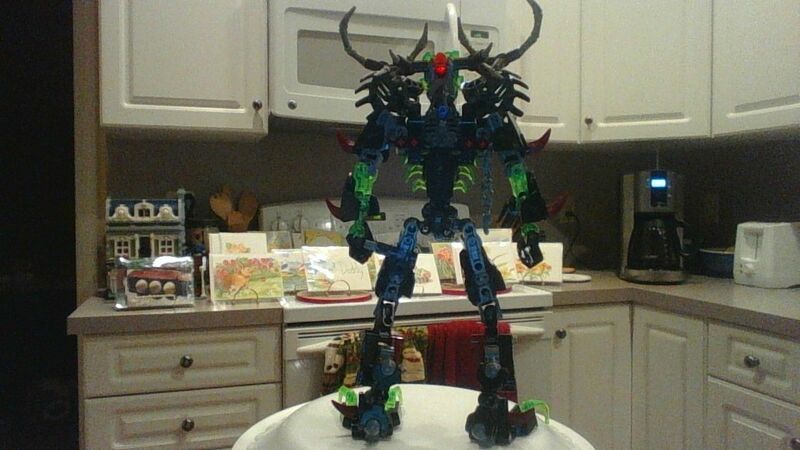 The majority of my Lewa mods are taken from Callan LoF on Youtube and Mocpages, that's where I got the ideas for the entire torso design and the shoulder redesign, as well as changing the placement of the Bohrok eyes to fill out the lower legs a bit. Closer look at the back (hah, you can see where the yellow axle holding the shoulders on is because of my fiddling with the arms). As you can see, this design completely removes the waist gear body in favor of a totally Technic design, utilizing those 1/3 axle pieces to create separate pivot points for the shoulder armor and the arms themselves. And create a broadsword! I personally think that this crystal broadsword looks more in proportion than Kopaka's, but that's just me. Unity Mode! The mods don't affect Unity at all, besides making it more awesome! Now for the other one: Tahu! This one is a bit more original, with the only idea really from someone else is the Ackar lower legs to replace the CCBS. A bit sticky and creaky with the newer parts, but it works. I also added some trans blue to his upper arms, to give the impression that the fire burns hottest nearest to his main body and core area, based off ideas of ki where the main pool of ki in a person is in their core...or something, I don't know . The back. Here's where you can easily see my biggest change (despite the balljointed axle 'hands' covering it). Originally I wanted to move the extra Unity bits to his biceps, but that looked too gappy and I didn't want to devote too many pieces to this mod (with Makuta Mocs to make and stuff, y'know). So I ended up with this. The shoulders are now held in with Glatorian necks, and I moved his gold Skull armor to his 'ceps, replaced by the Unity pieces. I actually had to buff out his chest slightly to make this work, but I think it looks solid. Also, he can store his weapons now. Yay. Unity Mode! The only change I made to Ikir was adding some shells to cover those open balljoints, so I didn't deem it noteworthy. Hope you enjoyed! Gotta love the painted eyes on Uxar! I might have to do that to all of my Creatures. Similar to my fixes, but better. The arms on Lewa definitely look a lot better. As for Uxar, I love that you painted his eyes; it just adds so much to him. Nice toa shoulders, there. Sort of more generic but I can't say it looks bad. I liked the tonfas better, they had more personality to them. Nice job though. Looks awesome, the upper arms are really cool. 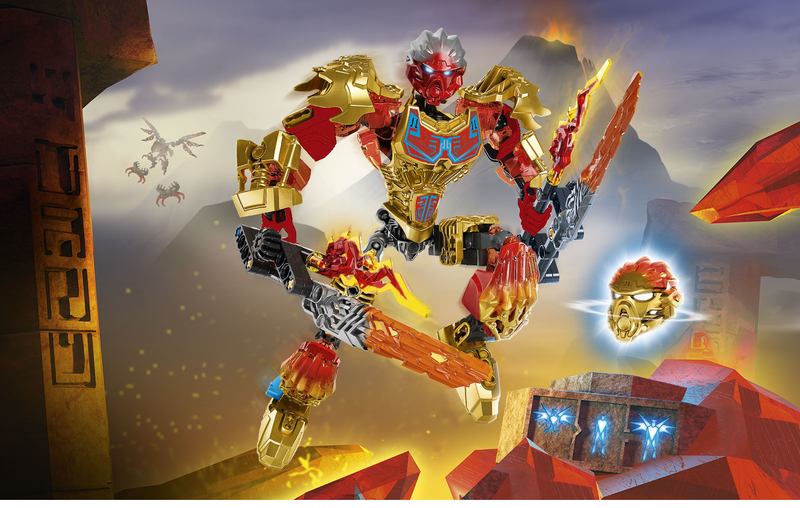 NOTE: There are some personal preference changes that prevent Tahu from being 100% JtO accurate, but I'm not bothered by that. My birthday was the sixth, and because of that I got enough money to order several sets off Amazon, including all six Toa. Tahu came yesterday, so (like Narmoto) I wanted him to be as accurate as possible. As for the personal preference changes I mentioned, I changed the attachment and color of the upper bohrock eyes, removed the gears from the swords and the crotch, and made all the pins on the sword function, blue. I tried to sort of recreate the mask swap scene. JtO Tahu next to JtO Narmoto. And Tahu next to my self moc Kasai, and Ekimu. 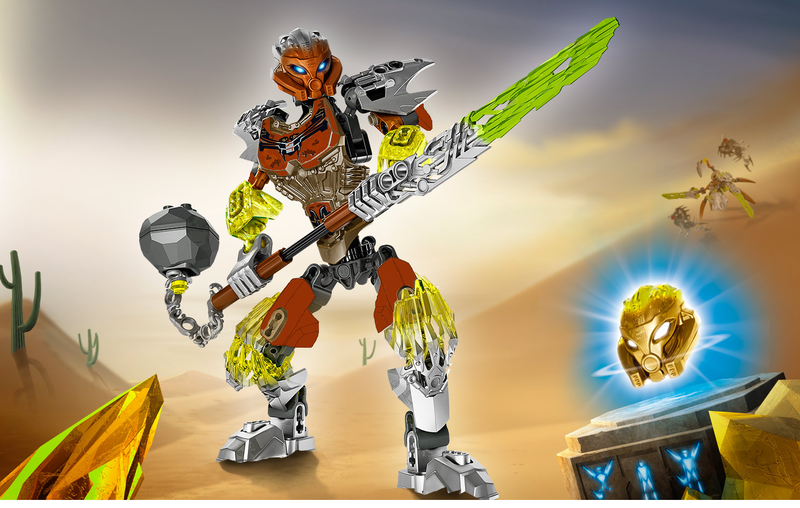 Now, for the moment you've all been waiting for, because who cares about Tahu? Oh..what? He's barely changed because he barely changed in JtO? Well that was anticlimactic, that Tahu though. All jokes aside, thank you for your time, and feedback. That's pretty cool how accurate you managed to make him.